Elen síla lumenn' omentielvo: Oh my word! 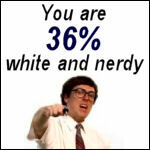 I am 18% White and Nerdy. Does this mean that I am 82% black and hipe? Isn't that just one of the greatest videos ever? Weird Al is a genius....the fact that our youth are listening to him 20+ years after I was listening to him is pretty amazing. 18% white and nerdy? I would've thought you were the "anti-white-and-nerdy"!